Warming huts, 2017. Courtesy of The Forks. Architect Peter Hargraves would like to level with you: We are not getting rid of winter. In 2009, Hargraves and his firm Sputnik Architecture proposed a design competition for warming huts on the frozen Red and Assiniboine rivers. 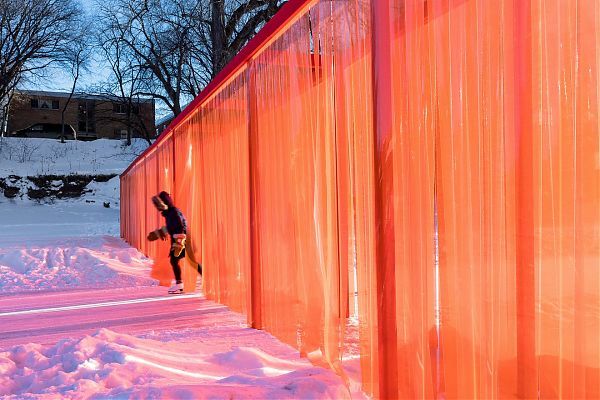 Every year since, a range of architects and students have answered the call, using a variety of materials from wood to snow and ice; this year’s winners will be unveiled on Friday, January 25. The new huts will join 25 of their predecessors on the ice, creating a miles-long skate trail that gives people a destination for exercise, sociability, and aesthetic contemplation. To get people energized to leave those houses in the first place, you need something more than a hut-shaped hut: You need an ice palace, you need a cave, you need the spirit of carnival. You need to make art of winter.